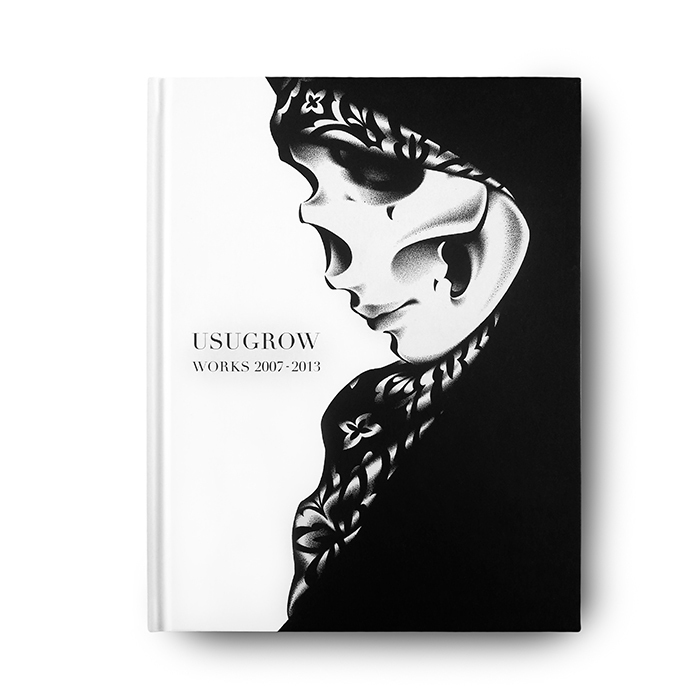 WORKS 2007 - 2013 by USUGROW [Japanese Edition] / Usugrow's second art book "USUGROW: WORKS 2007 - 2013"
Japanese Edition will be signed by the artist, encased in a black foiled or silver foiled(sold out) slipcase, available only through organic contrast. We are pleased to announce the release of Usugrow's second art book "USUGROW: WORKS 2007 - 2013", a compilation of the artist's best selected works from his last book "Love Hate from JP" which was released in 2007. This 180 pages, hardcover book showcases Usugrow's impressive black and white illustrations, his massive calligraphy on wall and canvas, and a wide variety of artworks that he has collaborated with musicians and skateboard companies. The Japanese edition is available only at the official online shop, or any Usugrow's official dealers in Japan. You can get a regular edition encased in a special slipcase. If you wish to receive only a regular edition, please purchase at amazon or foreign bookstores near you.